Bad habits me created but can be broken! 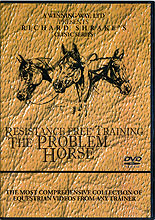 Richard Shrake gives the guidelines to create a positive bond with your horse and allows him to change through your teaching. Learn how to teach your horse patience, obedience through lateral flexion. the "pecking order," lateral control and exercises for bonding.